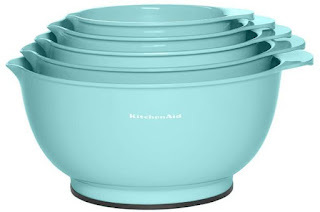 Hurry on over to Amazon where you can score this 5-Piece KitchenAid Mixing Bowl Set in aqua sky for only $29.99 shipped (Retail $39.99)! These bowls feature a non-slip base, pour spout and they nest together for easy storage. This set includes a 1.5-Quart, 2.5-Quart, 3.5-Quart, 4.5-Quart and 5.5-Quart bowl.